In a previous post I mentioned that I upgraded my homebrew install of Emacs after Emacs 26.2 was released, and noticed that I had lost its GUI functionality. That’s a pretty serious restriction for me as I usually end up with multiple frames across my desktop. I did end up installing the homebrew Emacs for Mac tap which restored the GUI functionality. It had have one niggling problem for me, though. My muscle memory says that I use Shift-Meta-7 (aka Meta-/ ) for keyword expansion as I use a German keyboard layout most of the time. Unfortunately, with Meta mapped to the Apple Command key, Shift-Meta-7 is a menu shortcut. Instead of expanding keywords, I kept opening menus. That clearly wouldn’t do. Malcolm Purvis had been kind enough to point out in a comment to my original homebrew Emacs post that Davide Restivo had created a brew tap that brings the necessary –with-cocoa build option back. He just upgraded it to Emacs 26.2, so this morning I rebuild my Emacs on OSX again and ended up where I wanted to be, with the latest version of Emacs, keyword expansion as I expected it to work, and a working GUI. Thanks, Davide! In fact, the above block is the only OS-specific configuration in my whole .emacs file. I’d like to keep it that way. I finally got around to upgrading my OS X installation from Mojave to High Sierra – my OS update schedule is usually based on the old pilot wisdom of “don’t fly the A model of anything”. As part of the upgrade, I ended up reinstalling all homebrew packages including Emacs to make sure I was all up to date. That proved to be a big mistake as I suddenly had a GUI-less Emacs. Of course I found the post on Irreal about the Emacs homebrew package being broken on Mojave after, well, I noticed that my Emacs GUI wasn’t working. Oops. A bit more poking around the Internet brought me to the homebrew cask for the Emacs Mac Port. As the screenshot below shows, it works with a UI on Mojave, so if you’re looking for an alternative to the regular Emacs port, this one seems to be fine, at least based on a quick “test drive”. Time to make sure that the installed packages are also working as it doesn’t seem to recognise org2blog and I ended up having to write this post in the WordPress editor. Can’t have that. In an earlier post, I described how to install the latest version of the Oracle Java JDK using homebrew. What hadn’t been completely obvious to me when I wrote the original blog post is that the ‘java’ cask will install the latest major version of the JDK. As a result, when I upgraded my JDK install today, I ended up with an upgrade from Java 8 to Java 9. On my personal machine that’s not a problem, but what if I wanted to stick with a specific major version of Java? Update: The title of this post isn’t quite correct – using the homebrew cask mentioned in this blog post will install the current major version of the Oracle JDK. If you want to install a specific major version of the JDK (6 or 8 at the time of writing), I describe how to do that in this new blog post. I’ve had a ‘manual’ install of JDK 8 on my Mac for quite a while, mainly to run Clojure. It was the typical “download from the Oracle website, then manually run the installer” deployment. As I move the management of more development tools from manual management over to homebrew, I decided to use homebrew to manage my Java installation also. It’s just so much easier to get updates and update information all in one place. Oh, and installs the same JDK anyway, just without all the additional pointy clicky work. Fortunately Oracle has uninstall operations on their website. It’s a rather manual approach but at least it is documented and the whole procedure consists of three commands. Unfortunately in my case this didn’t end up uninstalling an older version of the JDK. For some reason, I had ended up with both 1.8.0_60 and 1.8.0_131 installed on my machine, and Oracle’s uninstall instructions didn’t touch the 1.8.0_60 install in /System/Library/Frameworks/JavaVM.framework. I suspect this is an older JDK brought over from the Yosemite install and the consensus on the Internet I could find suggest to leave that alone as the system needs those. to verify which version it will install. I’ve recently switched to using Homebrew as my source for Emacs on OS X after seeing this blog post by Philip Ingram. 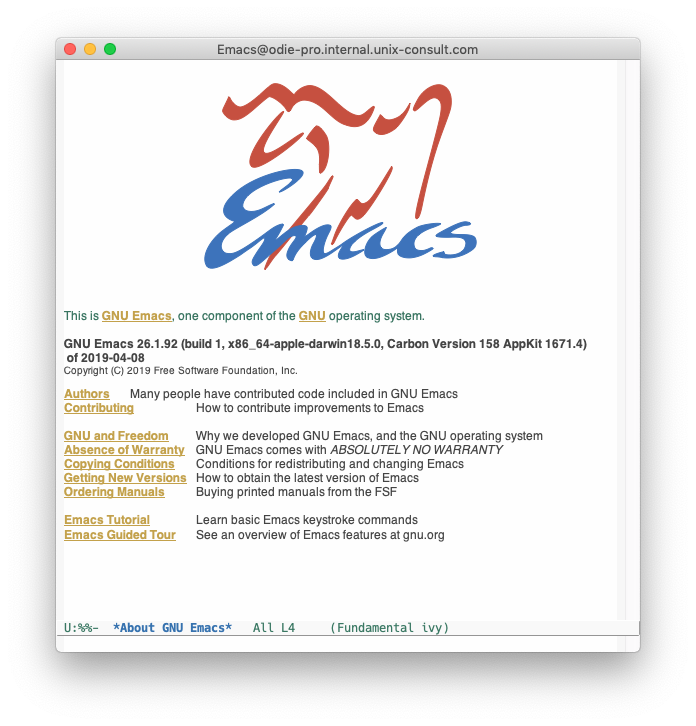 It’s a simple way to install a current Emacs once or twice a year. I don’t use beta versions or other pre-release versions on “productivity” machines, only released versions. My editor is too important a tool for me to risk using pre-release versions.